I'm back in creepy doll mode again. I can't help but find these fascinating, what about you? These Alice in Wonderland art dolls by Jennifer Sutherland on eBay are fantastic. These are dark and beautiful enough to collect and create your own Wonderland. 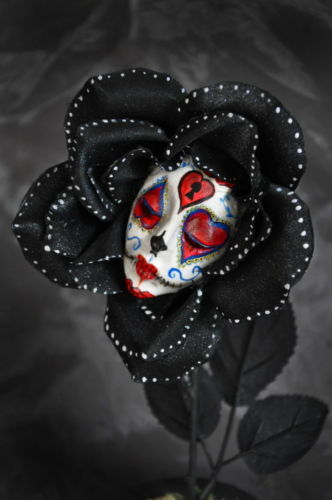 It would be so cool to create the flower scene using this sugar skull singing flower from Alice in Wonderland. It would create an ominous feeling to the flower garden. 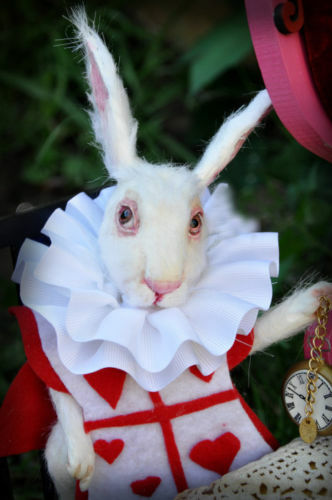 I hope this White Rabbit from Alice in Wonderland doll isn't a taxidermy. That would scare me, but I think I am safe. It's amazing how realistic he looks, even in his royal outfit. His glasses are so cute and hilarious. 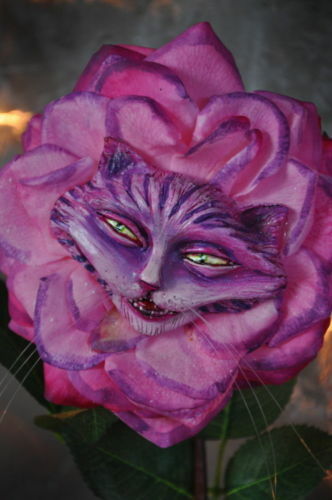 As much as I love the Cheshire Cat, I was instantly creeped out by this Cheshire Cat Alice in Wonderland flower. If you thought he was sinister before, take a look again. Maybe he was there with the flowers the whole time! I wouldn't take advice from this "Mr Webb" talking flower if I were Alice. He probably sang sad and ghastly songs while the others buried him with their happiness. 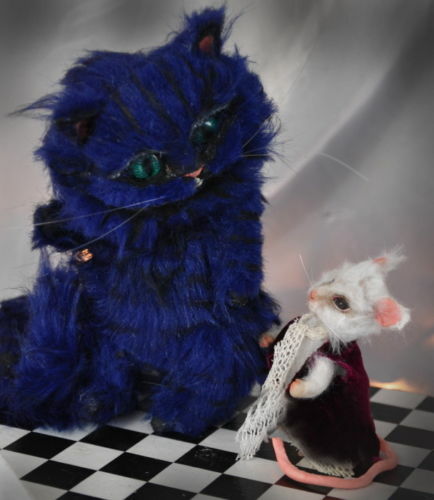 I adore this picture of the Cheshire Cat and the Maliumkin Door Mouse doll. Stick him in one of your teacups and you are ready for your own Mad Tea Party. You could even dress up as the Mad Hatter if you wanted. 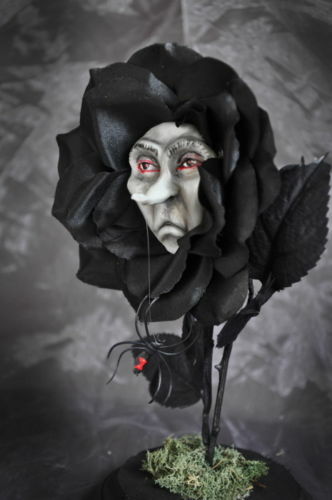 How would Alice react if she saw a Frankenflower talking flower? 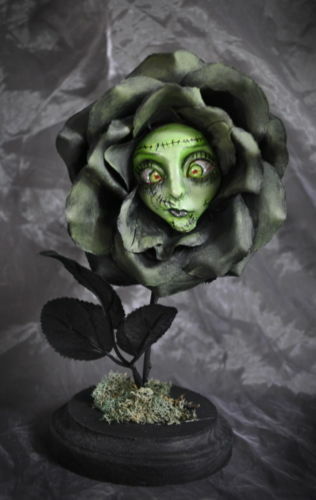 Would an undead flower want brains or just chlorophyll? This is starting to sound more like soylent green. This is already a really disturbing creature in my opinion. This mock turtle from Alice in Wonderland doll is surprisingly accurate from the illustration in Alice's Adventures in Wonderland. The poor sad mock turtle was once a REAL turtle. You can see the sadness in his eyes! 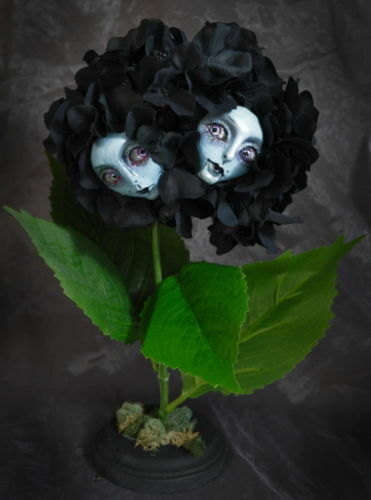 These hydrangea twins talking flowers look pretty unsettling. The twin peeking from behind the petals definitely looks like she is up to no good. I had to save the best for last! 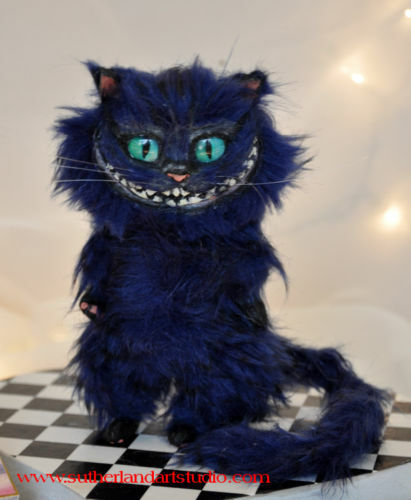 This Cheshire Cat doll is quirky and very mischievous. I'm not sure if I like his navy blue hair - I wish his stripes were more obvious! 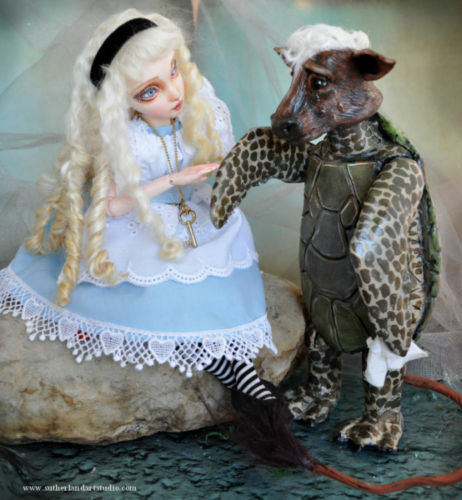 I am fascinated with these Alice in Wonderland art dolls by Jennifer Sutherland on eBay. They are lovely and disturbing, exactly how I imagine Wonderland being. You can easily tell a story with these dolls, just like the illustrations in the books. What do you think of this artists interpretation of all of Wonderland's characters? Make sure to comment below!